While manning the gunner position on an MRAP vehicle, CPL Tony Gonzales was killed when an IED hidden in the parking lot of a nearby mosque detonated his vehicle. Tony was the only member of his crew to die in the explosion. Growing up, Tony knew exactly what he wanted to do when he graduated high school: to follow in the footsteps of his father, a retired Air Force Veteran and Law Enforcement officer. From an early age, he worked hard to achieve the necessary steps to follow his plan to enlist in the Army before retiring and becoming a police officer. “TJ grew up wanting to join and serve in the military as I had, my father, uncles and cousins had,” his father, Tony Gonzales, said. In 2006, TJ formally joined the Army and shipped out to boot camp only a few months after he graduated from Freedom Alternative High in Turlock. He quickly acclimated to his new life in the Army, and went out of his way to help wherever he could. “Gonzo”, as his brothers-in-arms called him, took on many jobs in the Army: tank drive, gunner, Raven pilot, weapons ward and even took a turn as the platoon barber. In every job Gonzo was tasked with, he worked diligently and always excelled. “Gonzales was one of those soldiers that whatever job you put him in, he loved doing it,” SSG Timothy Cannon, who served with Gonzales, said. The easy-going, fun-loving soldier loved to make other people smile, and spent as much time as possible talking with his family, and girlfriend as possible while he was on deployment. He was eager to visit with family on the R&R visit scheduled only weeks after he died. CPL Tony Gonzales was 20 years old from Newman, California. 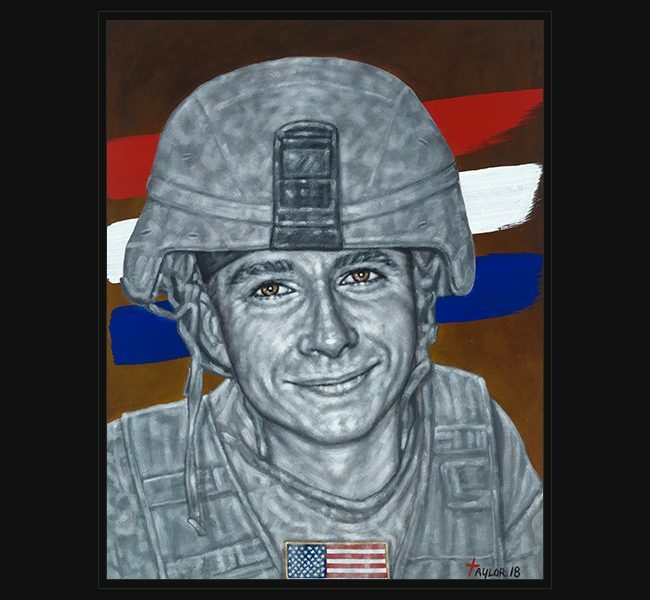 The original portrait was presented April 14, 2018 to his family at the Dallas Military Ball in a special ceremony.